JANUARY is a languid month in Brazil. 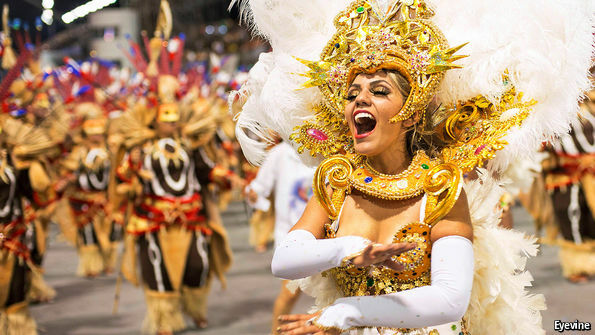 Beyond the hullabaloo at samba schools—practising for their bawdy annual face-off during Carnival, which starts on February 5th—business pauses while Brazilians go on holiday in the scorching southern summer. Fewer cars clog streets; more bodies throng the beaches. Politicians customarily switch off along with everyone else. Congressmen return from their Christmas break on February 2nd, but will probably do little until after Mardi Gras a week later. Neither they nor the president, Dilma Rousseff, will be able to relax, though. A frightening mosquito-borne disease has put the health authorities on high alert (see page 42). Meanwhile, Brazil’s political and economic crises are deepening. When politicians return to work they may regret the time they took off from attempting to solve them. The economic slide continues. The number of jobs in the formal sector fell by 1.5m in 2015, the fastest pace of job destruction since comparable records began in 1992. Another 1m could be lost this year, analysts reckon. Sales of vehicles dropped by a fifth last year. The IMF now predicts that GDP will shrink by 3.5% in 2016, more than three times as much as it expected in October. Despite the recession, inflation has risen to nearly 11%, its highest level since 2002 (see chart). Male breadwinners make up a higher proportion of the newly unemployed than in previous downturns, which mainly affected female and young workers, notes Naercio Menezes of Insper, a university in São Paulo. That means that the hardship caused by the current recession will be greater. For the relatively young, joblessness is a novelty. Many entered the formal labour market during the commodity boom of 2003-13. No one knows how they will react to their misfortune, warns Fernando Henrique Cardoso, a former Brazilian president who is also a sociologist. As misery grows, the government’s capacity to tackle its causes is diminishing. Prosecutors investigating the vast bribery scandal centred on Petrobras, the state-controlled oil-and-gas giant, are expected to file additional charges against senior figures in Ms Rousseff’s Workers’ Party (PT), which has already been badly tarnished by the affair. An even bigger worry for Ms Rousseff is the threat of impeachment against her on unrelated allegations that she assented to the use of accounting tricks to hide the true size of Brazil’s fiscal deficit. Her weakness makes her more dependent on the goodwill of the PT and trade unions aligned with it, which are viscerally opposed to the reforms needed to steady the economy. This month Ms Rousseff dared to acknowledge that Brazilians retire too early (at 55 for men, on average). In effect she admitted that the government cannot stabilise its finances if it continues to devote 40% of (non-interest) spending to pensions. But she backtracked in the face of resistance from her party and the unions. Raising the retirement age would be unacceptable, declared the PT this week. This will make it much harder for Nelson Barbosa, the newly appointed finance minister, to contain the budget deficit, which is close to 10% of GDP. His main idea is to reintroduce a financial-transactions tax, which is loathed by business but popular among Ms Rousseff’s left-wing allies. But this would raise just 10 billion reais ($2.5 billion) in extra revenue, a fraction of net government borrowing, expected to be 500 billion reais this year. Ms Rousseff wants to summon back a council of wise men and women, which she disbanded during her first term, to suggest reforms. That looks like a delaying tactic. While fiscal policy wobbles, economists are starting to fret about monetary policy, too. After weeks of hinting that it would raise interest rates to fight inflation, the Central Bank decided on January 20th to hold them steady at 14.25%. The decision may have been justified: higher rates would weaken the economy further and make it still harder to control the fiscal deficit. But it looked like a surrender to political pressure. The Central Bank’s president, Alexandre Tombini, met Ms Rousseff two days before the interest-rate decision. Then he foreshadowed the bank’s U-turn by pointing to the IMF’s gloomier predictions of Brazilian and global growth, which by that point should have been no surprise. 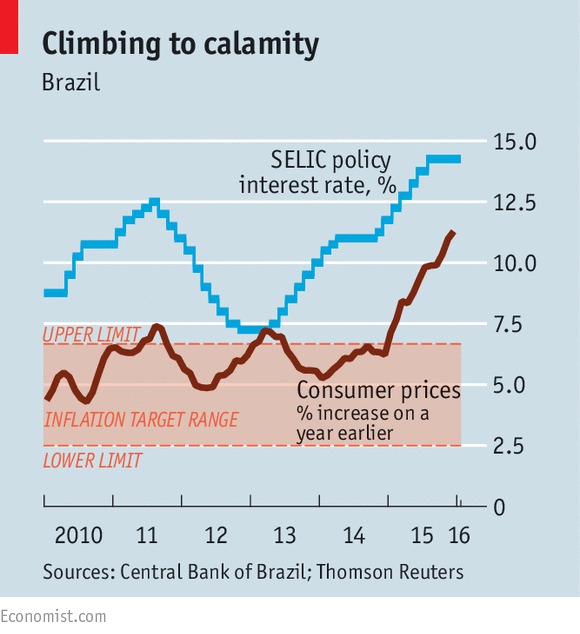 Rather than shoring up Brazil’s financial credibility, the Central Bank thus damaged it all the more. There is little prospect that congressmen will take measures to repair it when they return to work. Those who are pushing for Ms Rousseff’s impeachment concede privately that they are unlikely to muster the two-thirds majority needed in the lower house to send the motion to the Senate. But they plan to drag out the proceeding as long as the (vague) legal deadlines permit. That will accomplish their goal of undermining the president. It will do nothing to buck up Brazil. 0Respostas em Brazil - Partying on a precipice"